If you are booked to try our unique version of eco camping at The Secret Campsite Wild Boar Wood, you’ll be heading for the heart of Sussex. The campsite is near Brighton (30 mins by car), and within easy reach of Haywards Heath (12 mins), Lewes (15 mins) and Uckfield (15 mins). The Secret Campsite Wild Boar Wood is in a hidden away location a little off the beaten track. We offer our own version of ‘wild glamping’ breaks – an off-grid style of luxury camping – but please make sure you’ve booked prior to arrival. You can find us on Google Maps. If you input into Google Maps ‘The Secret Campsite Wild Boar Wood’. We are located down the south end of Treemans Road, 150 metres from the intersection with Monteswood Lane. To find us via a postcode please use RH17 7EA to find the High Weald Dairy/Tremains Farm. The dairy is approximately one mile from the campsite. With the dairy on your right, head south downhill along Treemans Road. Along the way you will drive past Cedar Cottage and Tremains Cottage Riding Stables on your right. Follow the road down the hill and over a small bridge. Continue up the hill you will see an arch canopy of trees across the road. Continue along Treemans Road (heading south) for another 150 metres. On your left you will see another metal gate, signposted for Wild Boar Wood Campsite. If you reach the T-intersection with Monteswood Lane turn around and head back north up Treemans road for 150 metres and the car park is on the right. Nearest Station: Haywards Heath (5 miles away). Trains run regularly from London Victoria and London Bridge and take approximately 40-45 mins. Trains from Brighton take 13-20 mins. Taxi From Haywards Heath Station: About 12-15 minutes. There are detailed driving instructions from Haywards Heath station, via Lindfield, in the directions link that get’s sent with your completed booking. The nearest bus stop is in the village of Horsted Keynes. Bus Route 270. The walking distance from Horsted Keynes is approximately 1.5 mile. Once you arrive at Wild Boar Wood just give the wardens (07936 381376) a call or text. It’s a short walk to the secret woodland campsite from the car park. We provide large wheelbarrows to assist with your belongings. 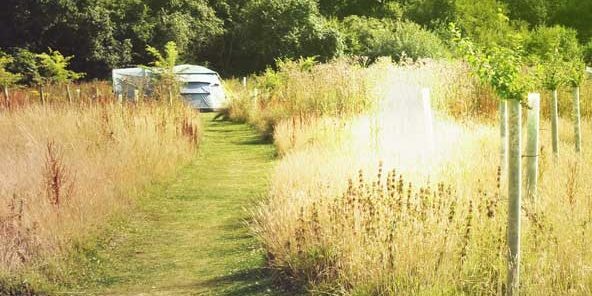 Our wardens live on site and are there to help you enjoy our version of eco camping. 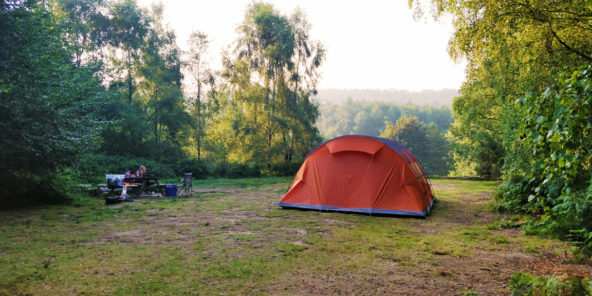 The bell tents are set up for you – the wardens have everything prepared for your arrival – your firewood allocation is supplied and we will show you around the forest campsite. Call or text the wardens if you have trouble finding us on your day of arrival. If you are trying to locate The Secret Campsite Beech Estate please click here.